It’s that time of year again! 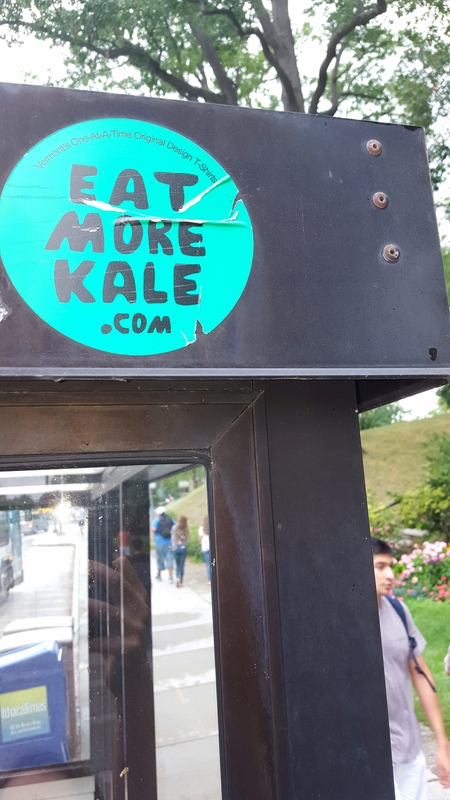 Back to Ithaca, NY–Land of Kale. Walking through campus a few days ago, I passed a produce stand chock full of fruit and vegetables harvested from Cornell’s student-run farm, Dilmun Hill. In dire need of produce to stock up for the next week, I grabbed a bunch of kale and some adorable mini beets. What could be better than local organic produce harvested by students?? Anyways, after a long first day of classes, I went looking through my pantry and fridge for something simple and delicious to whip up. One basic ingredient I keep on hand is whole grain pasta, usually angel hair. Sometimes whole grain spaghetti or penne is a little heavy, but angel hair pasta has such a light texture in the first place that the mouthfeel isn’t compromised even a bit by it being whole wheat. 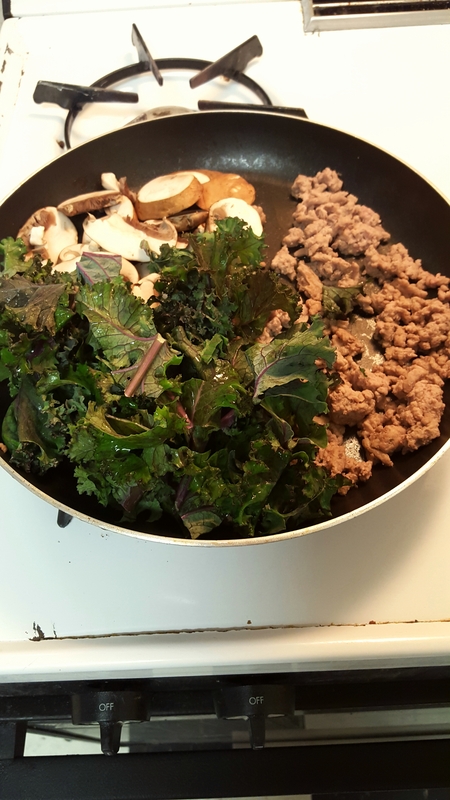 In addition, I had the kale from the campus farm, pre-sliced mushrooms, a pound of ground turkey (I like to use 94-95% lean for a balance of health and taste), and a bottle of affordable, yummy pasta sauce. Ok, you’re going to judge me for the sauce. 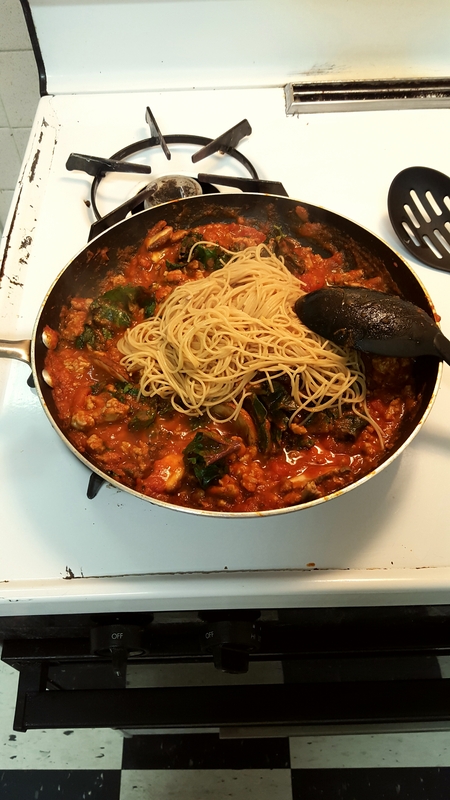 To be honest, I would love to say that every time I make pasta I take the time to make my own sauce, but sometimes that is just really not feasible with the constraints of a busy schedule. I started out by drizzling a little bit of olive oil in a pan and browning the turkey. I also got a small pot of water heating up on another burner (don’t mind my old, dinky oven/stove, it’s mostly functional). I drained the turkey and put about 2/3 cup back in the pan, letting the rest cool off in a Tupperware for meals later in the week. I added ~1 cup chopped kale and 1/4 cup sliced mushrooms. I then poured 1/2 of the bottle of pasta sauce I had on hand in the pan, turned the stove back on, and and stirred away. 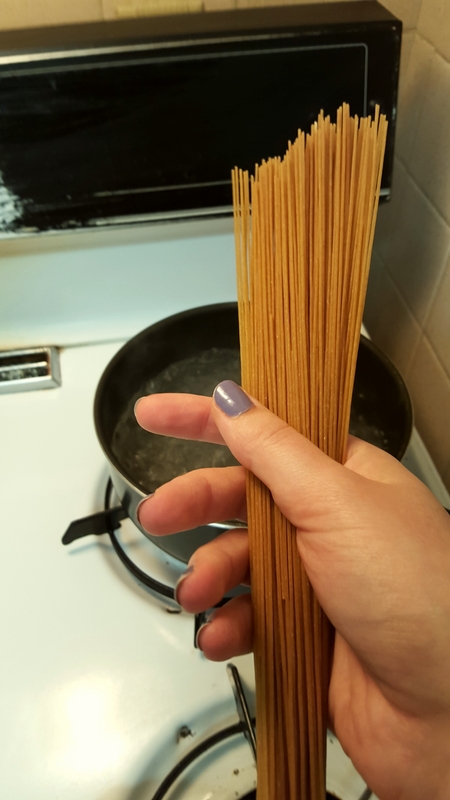 By that time, the water was boiling on the other burner, so I added a small fistful of whole grain angel hair pasta and stirred it in. I kept stirring the sauce, turkey and veggie mixture to distribute the heat and keep it from burning. This also helped wilt the kale. After the pasta was cooked to al dente (4 minutes, I followed the directions on the box), I drained it and mixed it into the sauce. This whole process left me with just about two servings of pasta and sauce. Yay leftovers!! It turned out beautiful and delicious if I do say myself. There you have it: protein, carbs, fiber, and vegetables, all in a snap. 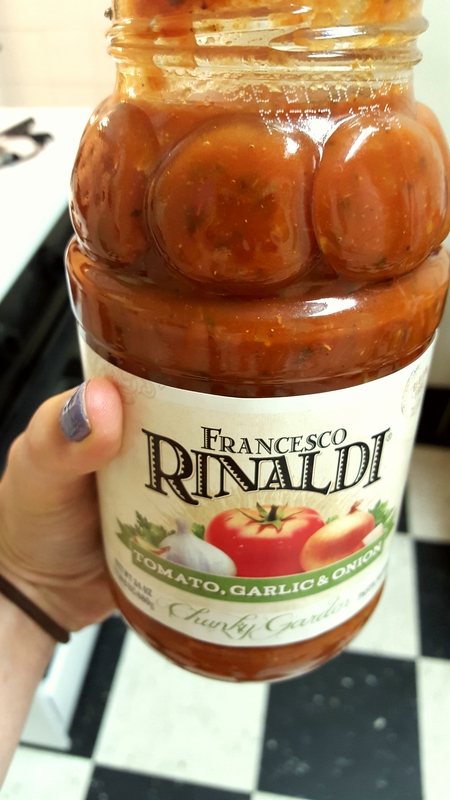 The pre-made pasta sauce contributed easy flavor, a significant amount of nutrients, a little bit of healthy fat, and some acid to help with iron absorption from the kale and mushrooms. Make this vegan by substituting beans, tofu, or seitan for the turkey! 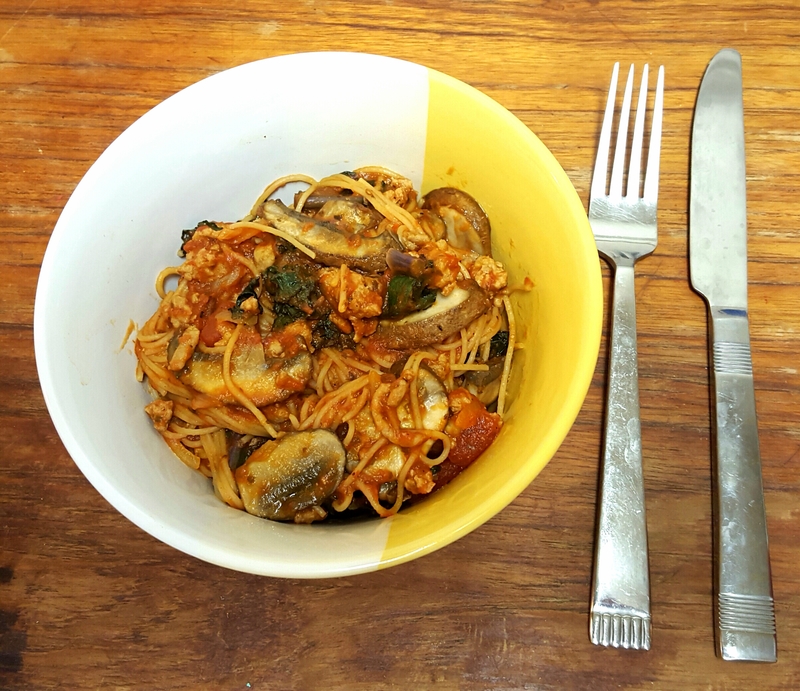 A filling and nutritious pasta dinner for two- or one with leftovers. Set a small pot of water on the stove to boil. Heat 1 tablespoon olive oil in a large, heavy-bottomed pan on the stove over medium heat. Brown the turkey in the heated olive oil until cooked thoroughly. Drain in a colander, place 2/3 cup browned turkey back in the pan and set aside the rest for use in other meals. Add the kale and mushrooms to the heated pan, stir in the pasta sauce. By now the water should be boiling; stir in the pasta and cook to al dente according to the directions on the package. 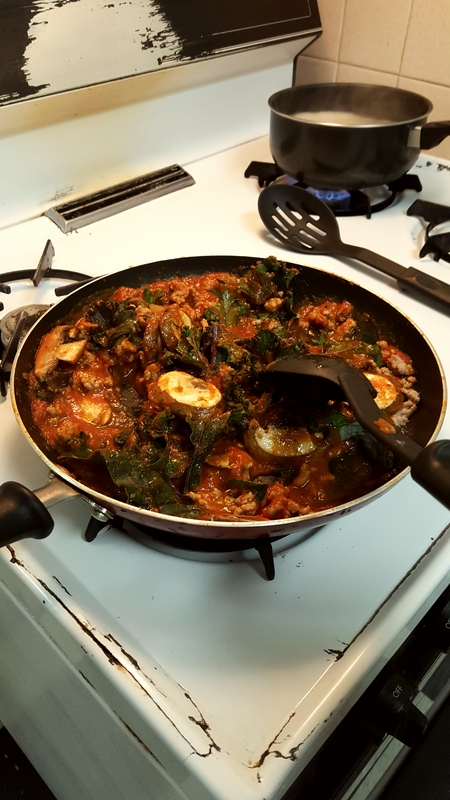 Continue cooking the meat and veggie sauce until it starts to bubble and the kale wilts. Turn the heat down to low when the kale is fully wilted. 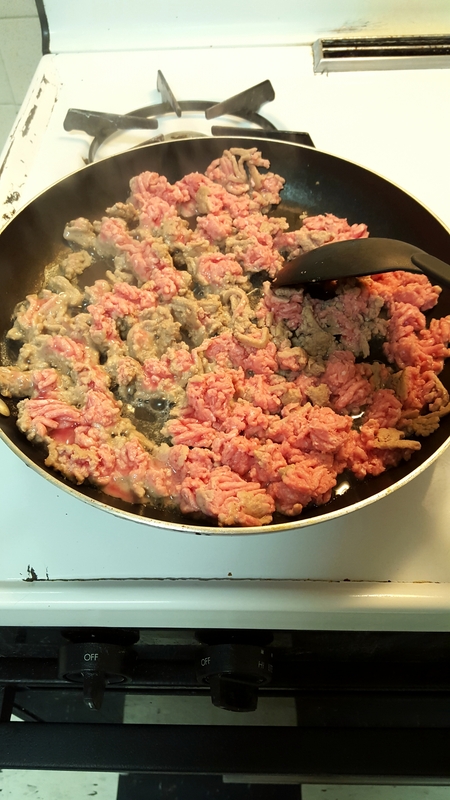 When the pasta is done cooking, drain and add to the sauce pan. Stir it in and then serve immediately.